The somewhat unseasonable cool weather we have been having (29 degrees in Clarksville Thursday night) has made me postpone planting my spring broccoli and cauliflower. While these plants will withstand cool weather, very cool weather causes them to form button heads rather than full size flower heads. As a result, I have 16 flats of cool season vegetables waiting in my cold frames, some for my garden and some for a food bank garden where I volunteer. So with the warmer weather predicted for this weekend, I decided to plant some Packman broccoli, Snow Crown cauliflower, Golden Acre cabbage, Early White Vienna kohlrabi, Red Sails and Buttercrunch lettuce. I plant Packman and Snow Crown in the spring because they have short “days to maturity” times (55 and 60 days, respectively), usually yielding beautiful heads of broccoli and cauliflower before the hot June weather arrives. I prepared my bed by adding .2 pound of nitrogen per 100 square feet and working it into the soil. In the spring, I use a ntirogen source that has readily available nitrogen since the microbes in the soil aren’t fully active in cool soil. Next, I planted my broccoli, cauliflower and cabbage transplants in an X pattern. The plants at the corners of the X are spaced at 3 feet apart, while the center transplant is 18 inches from the corners. This pattern yields 5 plants in a 3 by 3 foot space. 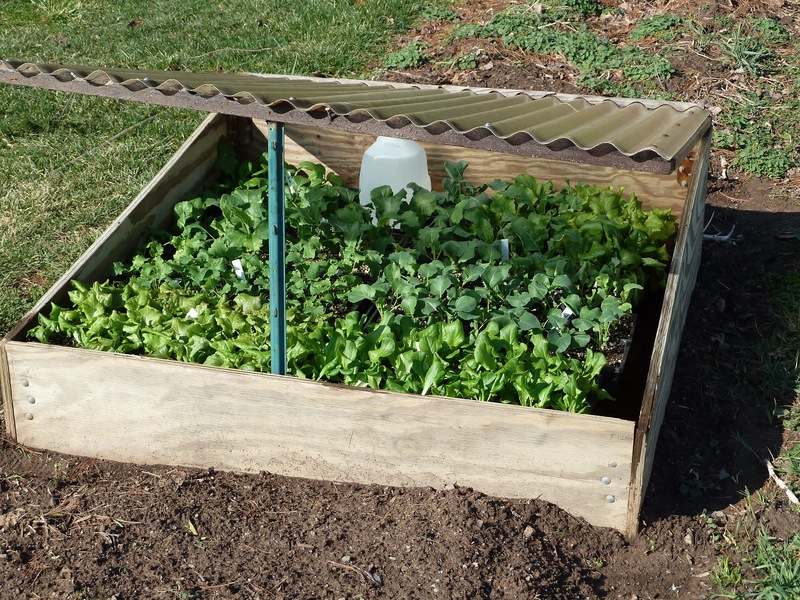 In the space between the broccoli, cauliflower and cabbage, I plant my lettuce, which will yield before the brassicas and ultimately be shaded by the larger plants. My kohlrabi is planted on one foot centers which allows me to get 25 plants in a 3 foot section of my raised bed. Each transplant is watered in with a 50% solution of water soluble fetilizer to get them off to a great start. 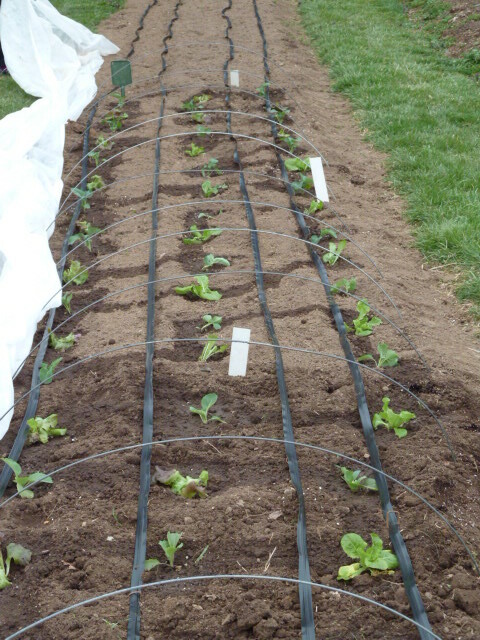 Next, I laid out my drip irrigation tubes and placed my wire hoops over the beds to support my insect barrier row cover. The wire hoops are made from 9 gauge galvanized wire and are 76 inches long. The wire supports the row cover and protects the small transplants from the row cover. Later, as the brassicas get larger, I’ll remove the wire and let the brassicas support the insect barrier. Lastly, I place the row cover over the wire hoops and tack it to the ground using sod staples. 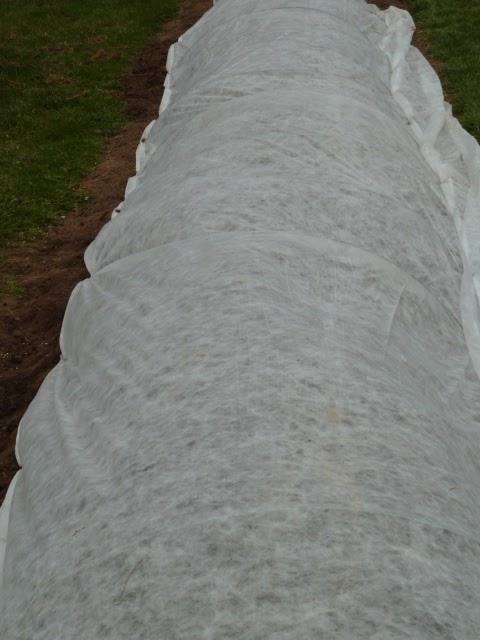 With the row cover and drip irrigation in place, I know that I’ll have delicious broccoli and cauliflower in late May. The lettuce and kohlrabi will be ready for the kitchen in early May. Kent, I love — and stand in awe — of the neatness of this rig and your rows. This week should make everything pop!